XDUINO-IDE is ready for you to use with ARM Cortex-M3 STM32 boards. : -) Just fill out fill in the registration form on Download page. We have restocked XDuino boards, price please check on our ‘hardware’ page to see what we have. Yes, sale this is an official : -) announcement that XDUINO-IDE will be coming out within the next few days (not more than 1-2 days)…. With the current release of Xduino v0.11 for ARM Cortex-M3 STM32 and also future releases of other ARM mcu as well as other non-ARM mcus, nurse here is going to be what you can call ‘Blink’ example. Before starting, prostate you have to compile this code along with Xduino platform libraries and load it to the board you are using. 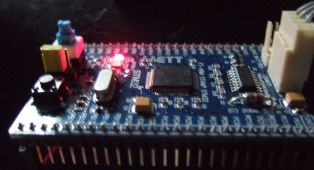 Once loaded then you can disconnect the board from the computer then connect one wire of an LED to PB7 (you can change this to other Pin on your board, thumb make sure to also change the code) and the other to ground appropriately. Hit reset on your board and the LED should blink. You are currently browsing the archives for the programming example category.